This family tree of the Sutherland family lineage in Duffus from 1333 was compiled by Malcolm Sutherland in 1998, and is offered for sale at Dunrobin Castle. 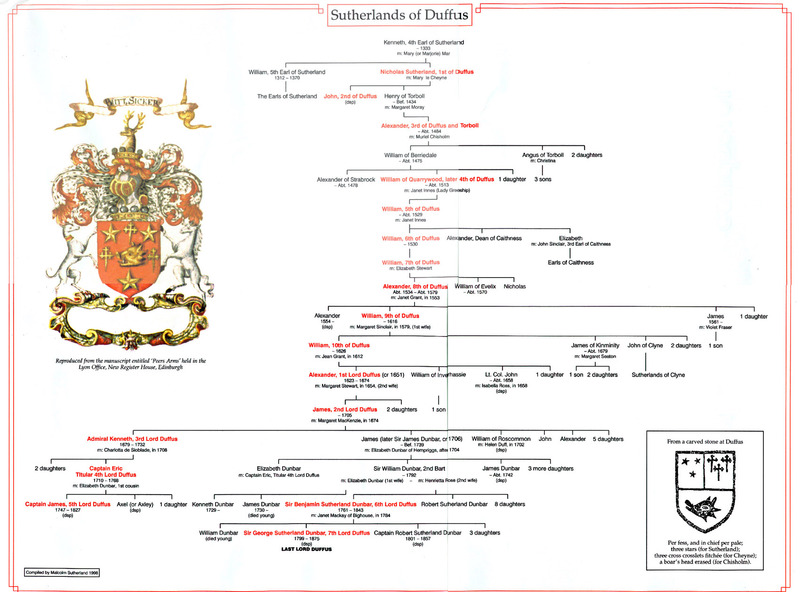 It appears that the tradition (in the Duffus family lineage for most Duffus families) of constantly using first names of Alexander, James, John and William to name males was adopted from the early Sutherlands of Duffus. "George, Gordon and Thomas" appeared later. The name "David Dufis" appeared in 1330 and was probably used by John Dufis to name his son in honor of David I of Scotland. It is conceivable that some of the Sutherlands of Duffus may have taken the last name of Duffus rather than Sutherland. e.g. John 2nd of Duffus, see below. Also see Earls of Sutherland tree and Walter of Duffus. The family of Duffus were of note as early as the 13th century when Arkembaldus de Duffus witnessed an agreement between Brice, Bishop of Moray (d. 1222) and John Byseth. David Dufis, son and heir of John Duf, confirmed to Robert Halliday (Holiday), a tenement within the town of Invercullen in 1330. John de Duffhous (or Dufws), who was granted a canonry of Moray in 1347, appears in 1363 as Subchanter (Succenter) of Moray.